I fell in love with Catherine and Florent from the first email! Catherine and Florent are genuine loving people! 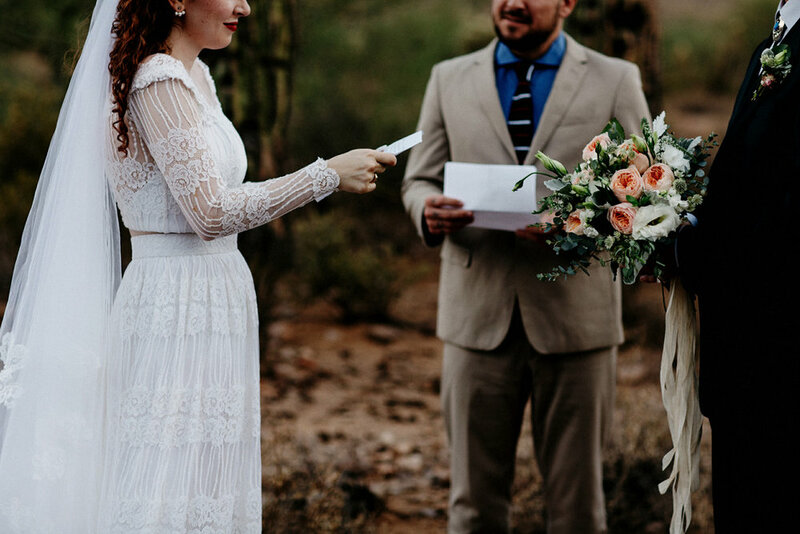 They traveled from Canada to get married in the desert! All Catherine said was, "I want to get married by a cacti, even if its on the corner of a street." 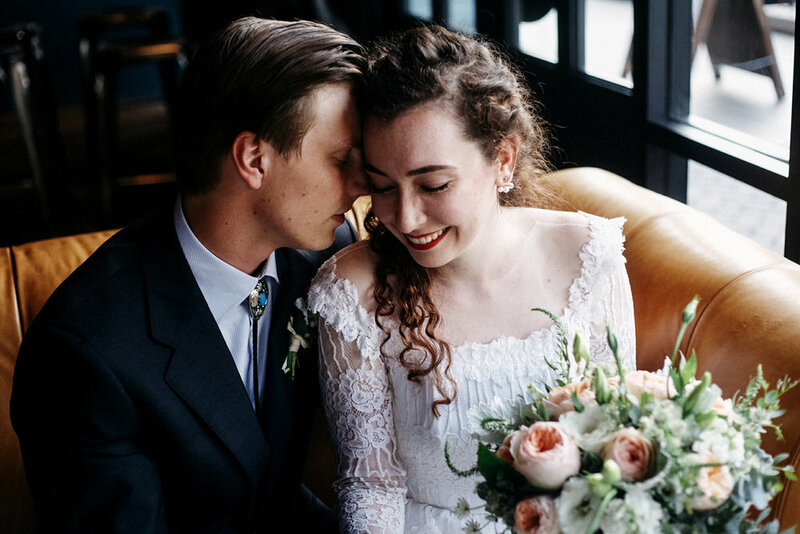 Catherine shared her story behind how she found her vintage gown, how Florent found her vintage ring ring and how she dreamt about being married Florent forever! Our time together began at Camelback Floral Shop, followed by coffee at The Henry and the "I do's" were vowed in the desert by the cacti! To give you a real insight of who this couple is, you must read Catherine's words. Every word from her is worth the read! 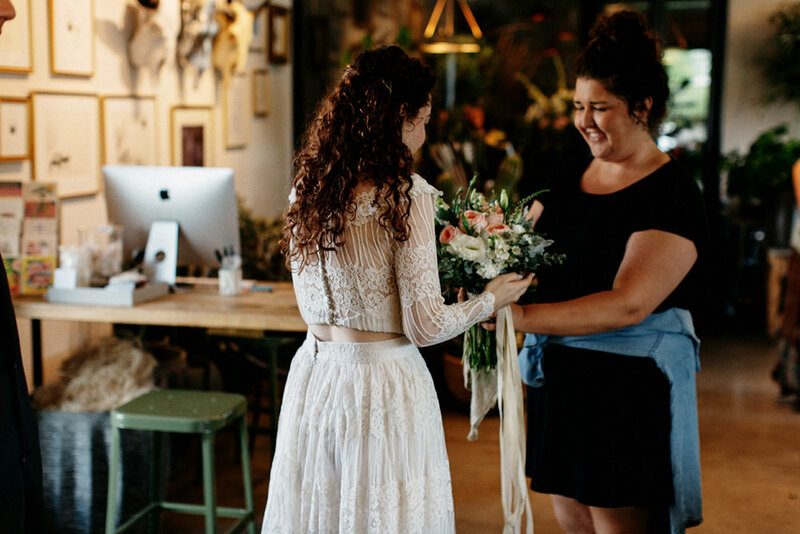 "One morning I woke up and it was clear: I wanted to get married in the cacti. Not actually in - but surrounded by them. 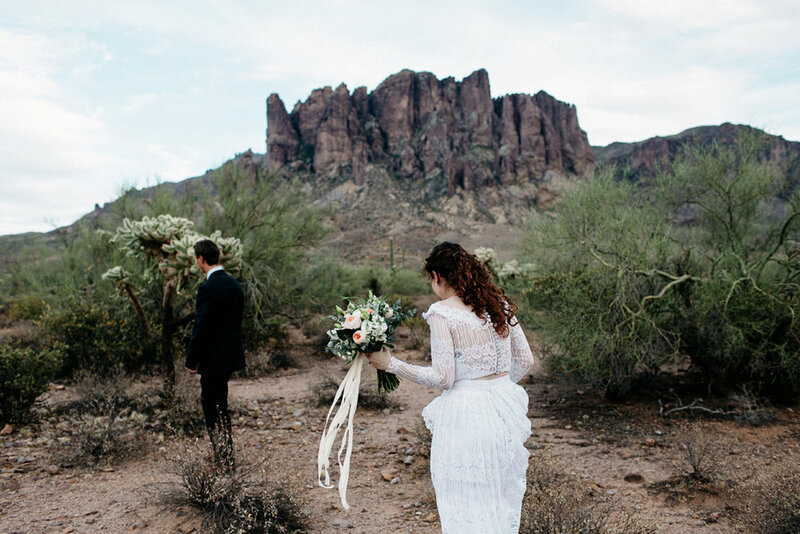 I ran to my computer and googled "Arizona elopements". It could be done. We were already traveling to Phoenix for a nail class and a vacation so it made sense. I had sought out this amazing nail artist to train me and I was really excited. Sadly, the last past weeks were a blur. 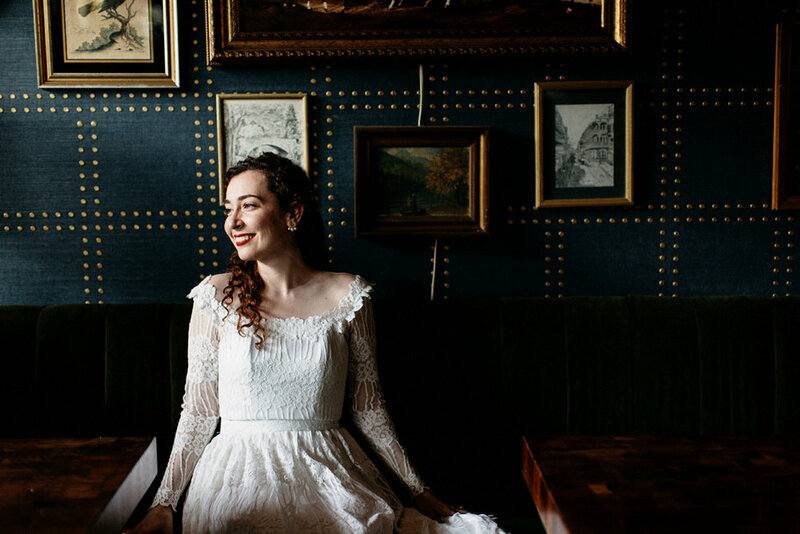 My family was fighting with me and with each other and at the center of it all was our wedding. We were planning a sweet small traditional wedding but things got way out of hand. I didn't want to get married anymore. I didn’t want a five course meal with an open bar. I didn’t want to invite people that actually cared more about the napkins then our love. Worst of all, we didn't want to be buried in debt to uphold everyone's expectations. I always thought we were the lucky ones: we met young and had a wonderful relationship. Was it easy? Never. Was it worth it? Always. We met when I was 14. We took the same bus ride home together. I couldn't look at him directly, he was like the sun. I would turn away all flustered and red. We never spoke. We finally "met" a year later through a friend. To make a long story short: My mom being a mom made friends with a family when we were on vacation in Florida. It would be too easy if I had met him right then but, the boy I met went to his school. That boy in question and I set my best friend up with one of his friends. That friend that she ended up dating for 4 years is one of my husband's best friends. From that point on we were always around each other but never really spoke. When he proposed I couldn't say I was not expecting it. I was not expecting it that second, but I knew it was coming. The summer before our 8th year anniversary we were heading to Quebec City for the weekend to meet with his parents who were staying there for the week. Obviously, we forgot to put gas so we ended up at this random gas station not too far from our house. That's when I realized we were next to an «antique meets garbage» market. I wanted to go. So there it was. The ring was sitting in a counter. I knew it and he knew it. We spoke to the lady selling it and took her card. We left. I didn't want to show my deception because I wanted him to want it as much as I did. Then he turned around and grabbed my hands: you want it? He said. I wiggled my head up and down and smiled. A 100 year old, hand cut, diamond platinum ring and the best part: she had not appraised it yet. He kept the ring for 8 months or so before proposing. He had made a custom band. Again we hit the jackpot. When we asked for white gold and ended up with platinum instead, we were floored. The jeweler made a mistake. He had to let it go at a lower price because it was made for us and he could not resell it. How did we go from being around each other to dating? I couldn't tell you what happened or how but one night he showed up at my house around 9h pm. He was turning 17 in a few weeks. He had ringed every doorbell on the block that had flowers on the porch. My best friend told his best friend then told him that my house was the flower house. He found it. He was ecstatic. My mom opened the door then proceeded to let me know that a tall blond guy was at the door. It never occurred to me that it was him but there he was all smiles. I was in my pajamas. We went out on the porch and he told me these exact words: I know we don't know each other but I know we need to live this. I called him crazy. He proposed the 5th of January 2016. We were still in bed. He had given me gift cards for Christmas. The actual present was that I would get a day with him to go and spend them. He was not allowed to complain or bicker and he would take me where ever I wanted to go. That morning, I woke up early and bugged him so he'd wake up. I was on my phone waiting on him. I was lying in bed next to him, scrolling down on my phone. Out of nowhere, he turned to me and said: do you want your ring? My eyes still on my phone, I giggled and told him to stop playing with me. Then he said it again. So I turned to him and he went on: today is your day so I thought I should give it to you. You always tell me that your favorite moment of the day is when you wake up next to me, so I figured I should ask you now, he said while my eyes filled with happy tears. "Will you be my wife?" Yes, a million times yes. It was the best day. After my quick Google search, I jumped in bed and woke him up. "Do you want to get married in the cacti?" I whispered to him. He looked at me with a question mark on his face. We already had the church booked. We were well underway to be going through with this nightmare that terrified him. So many people. So much money. He asked if I was sure. He was going to think about it. Later that day he texted me: it would be an honor to marry you in the cacti. It was going to happen. It would be a lie to say that everything was always perfect between us. I think we were smart enough to know the value of what we have even if we do sometimes get lost. Although we did call it quits for one full year when we were 20, we worked it out. Again, I never expected us to get back together. I guess with the right timing and a twist of fate we were back in each other's life. That's when I learned never to take him for granted. Every single morning that I wake up next to him is a blessing. We were going to wing it in Arizona. Blindly going there and trying to get married was the plan. I wanted pictures. If we were to go and not have anyone there, I wanted all the pictures we could get. I searched the internet and emailed a couple of people. I would always come up disappointed. The pictures always ended up looking like the people were posing. These pictures were beautifully orchestrated, but then again they were empty of feeling. At that point I had almost given up when I stumbled across Tish Carlson’s Instagram. It was magical. I showed my fiancée and he agreed. What I liked the most about her page was that the people were living, doing and feeling. It was breathtaking. I emailed her right away and told her our story. In midst of all things, I had given up on finding a dress. The dresses under a certain price point were like plastic gowns and the rest were unattainable. Putting so much into one thing that you'll wear for 5 hours seemed crazy. So I settled, I would buy a simple white dress and call it a day. My family was originally supposed to buy my dress as a wedding gift. Then the arguments started, my appointment at the bridal store was cancelled. I was devastated. I cried and was ashamed of it. It was so petty. Just a dress, but I was crushed. One Sunday morning, my best friend Lisa, my fiancé and I ended up going shopping. She had a baby shower later that day and needed to buy a gift last minute. I wanted to browse dresses. I found a skirt. On the way back home I asked my fiancé to take the long road home. I wanted to see the water and not the highway. There it was hanging on someone's porch. Garage sale. Stop the car, I shouted. All lace, long sleeve it was perfect. To top it all, the lady who sold it to me had the same name as my mother. She had the gown made for herself 20 years ago. She showed me the veil that went with it. I was astonished when she told me who designed it. I knew the designer! The store where I worked was on top of her boutique, she had been our landlord before we moved. She sold me the dress and veil for 25$ and told me she believed the dress was going to the right person. My fiancé returned the skirt that Monday. After that email was sent, I spoke to Tish on the phone the following day. The first question she asked me was why we only wanted portraits. I explain our non-existent plan. "Would you be okay if I found you someone to marry you? She said. I was amazed. This stranger wanted to help us make our day come true. I held back tears. We picked a date together: the 2nd of August. 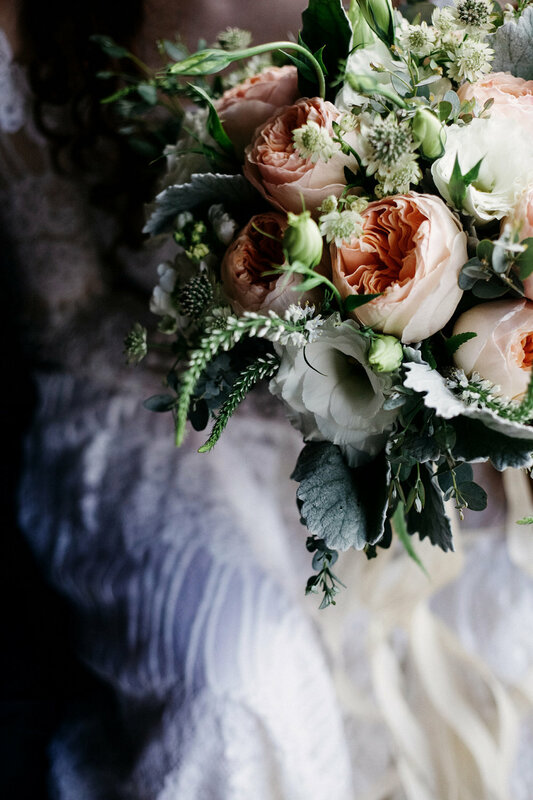 Do you have a bouquet? She asked. I didn't. I didn't need one but, if I did it have one it would be great. She was going to make it happen for us. We landed in Phoenix on 31st of July; I couldn't believe it was happening. We were going to get married in a few days. On that Monday we tried getting our wedding license. Unfortunately the system was down in the whole county. It had never happened before, the clerk said to us. That day we called every hour until closing. I was panicking. Is this a sign? I said while my fiancé was giggling. It's you, you broke it, he said laughing. We were going to be fine. We would call back in the morning. The morning of our wedding, we rushed to get our license. Once it was in hand, I calmed down. My fiancé was getting nervous. He just wanted it to be done. We slowly got ready until we met Tish at 3h at the camelback flower shop. Everything I had planned for my hair and makeup changed. I improvised. I hope to think it was meant to be that way. It turned out quite alright. When we met Tish all our emotions settled. We started taking pictures right away. Before heading to the Superstition Mountain, we stopped by The Henry to enjoy a coffee and take some pictures. As the day progressed, my fiancé started to get more comfortable. He loosened up. It's passing by so fast, he said to me. Enjoy it, I whispered to him. When we met John, we knew he was the right fit for us. I don't know if it was the tattoos on his hands and knuckles or the smile stuck to his face that made us love him immediately. 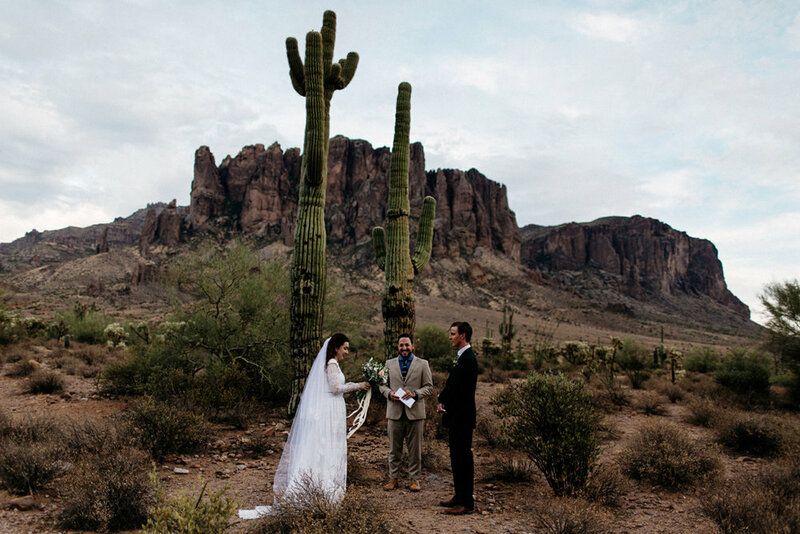 Between two cacti, next to the mountain, he proceeded to marry us. It happened! It was done. Never in my wildest dreams had I thought this would happen. That night, my husband said to me that he would redo all of it a million times over. I would too, even that scary dirt road leading up to the mountain. After we popped the champagne, signed the papers and took some end of the night pictures we headed back. I'm still trying to recall every second of the ceremony. It was honest, brief and real. We read our vows in French. We cried. What John said was us to a tee: ‘’you enter this marriage not as one but as two people with dreams and goals who'll be there to support and love each other through the hard times and the good times". He didn't say these exact words because all of it is a bit blurry, but it is the essence of what he said that matters. Our love will go on, but we have to nurture it and nurture ourselves. We have to always make sure we leave ourselves room to grow on our own and together as a team. John married us out of the kindness of his heart. He made that day extra special for us even if we met for the first time on our wedding day. Throughout this whole process we learned about love. About how much kindness is still left in the world; how so many extraordinary people came together for us to make our day happen. I was drowning under all my fears and family issues and Tish helped us see the light. We did not have the wedding I thought I wanted, but we had the one we needed. In the end, I know how lucky we are. Eating In-n-out for the first time in the back of Tish’s car on our way to our Airbnb, I recalled what I said to my husband as I read him my vows: I wish us a life full of little miracles, because you are the big miracle of my life. We did it."